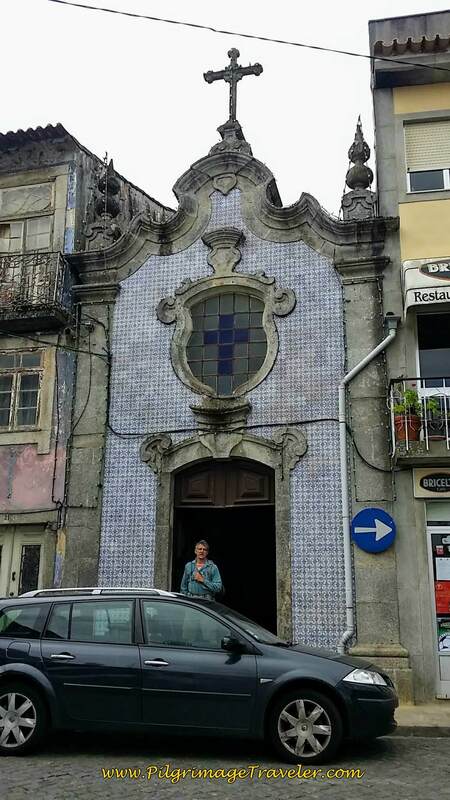 Our day sixteen on the Camino Portugués was along urban areas, a bit of coast and through verdant fields of Portugal, then a jaunt through smaller towns. It was a day completely different than the prior day. This day we met many new pilgrims, from many different places, yet saw no one that we had seen before. It was a day of lots of new faces, yet we made very few connections! Our Aussie friend Rob decided to walk inland and take up the Interior Route. Our British friend Steve, for some reason, we never stumbled into! And Chris and Christine, also from Australia were two days behind. As for the dawns, while we had seen some glorious ones thus far, on the Caminho da Costa, there was only daybreak. Nice enough, especially along the River Ave. Here is my Google map, of my GPS tracks. The map is just like you would expect, so open it, zoom it, move it around, etc. I did place our accommodation and the cafés where we stopped along the way on the map. For a complete list of accommodations, click here. 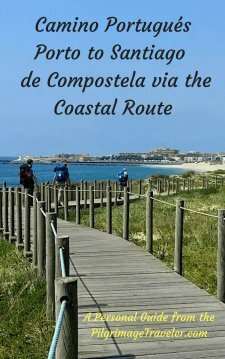 We essentially stayed along the traditional Coastal Route on this day. Again, walking along the coast, there is very, very little elevation change as you can see. We ate our cold breakfast in our albergue before setting off. 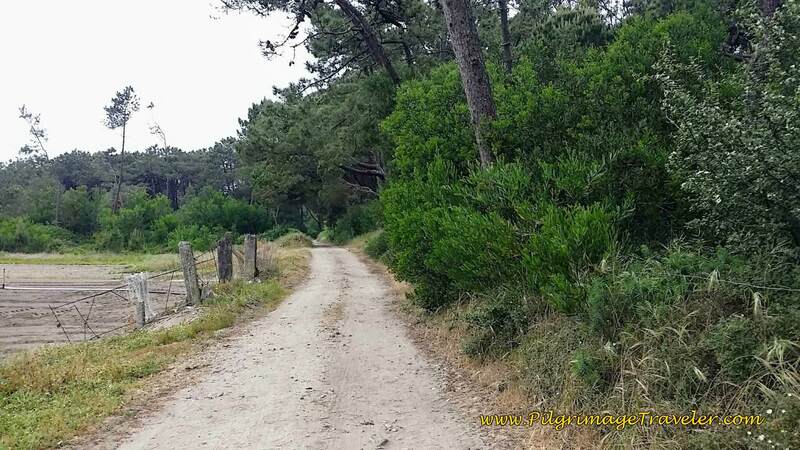 I wanted to go back to where the Camino left off at the Ave River, so we retraced our steps a few meters, to take the official route from the river. 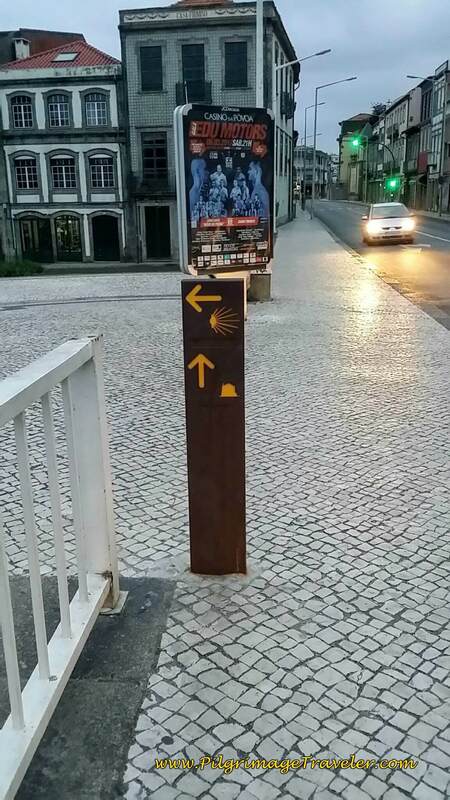 After crossing the Ave River, the pilgrimage traveler must take a left as the waymark indicates and walk down stairs and across the Praça da República to the east side. You can see the waterfront from the plaza. 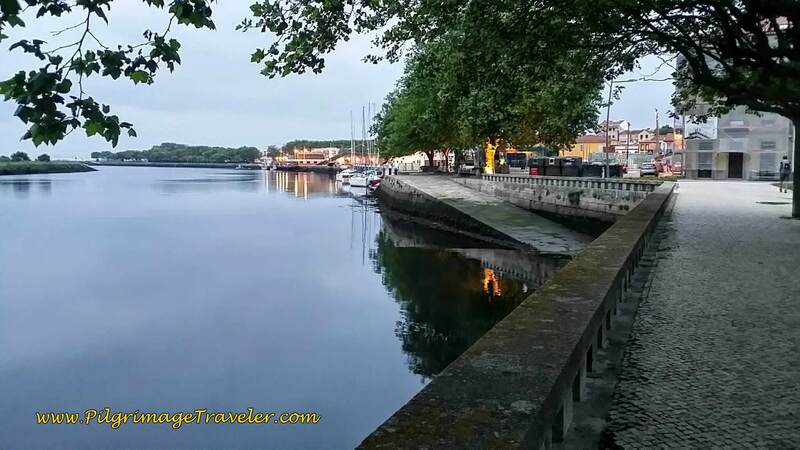 The waterfront of the Rio Ave was gorgeous and so peaceful. 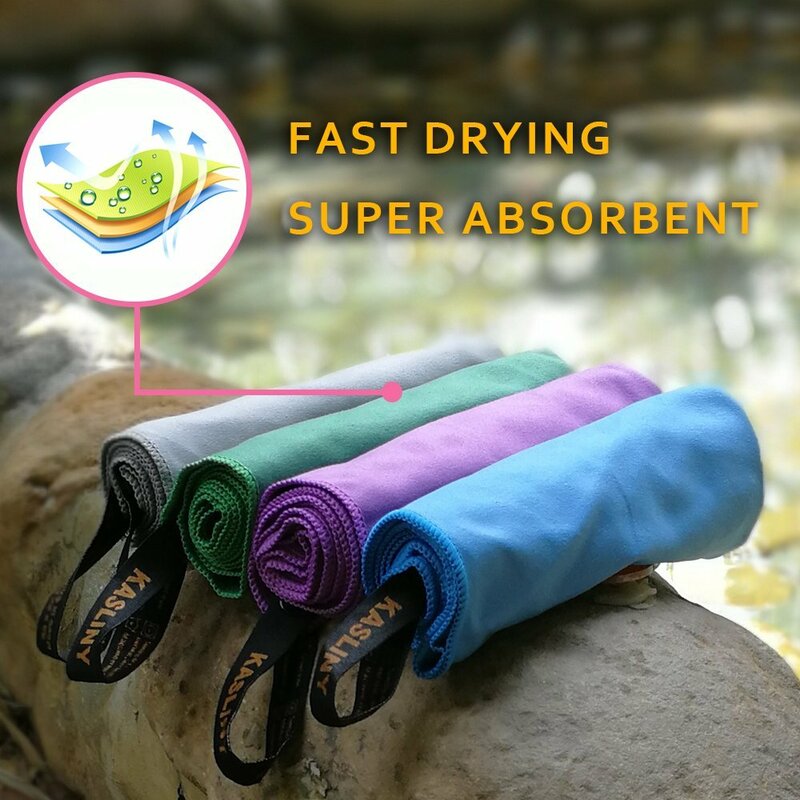 Here you have the option to take the Senda Litoral, and continue to follow the Ave River. 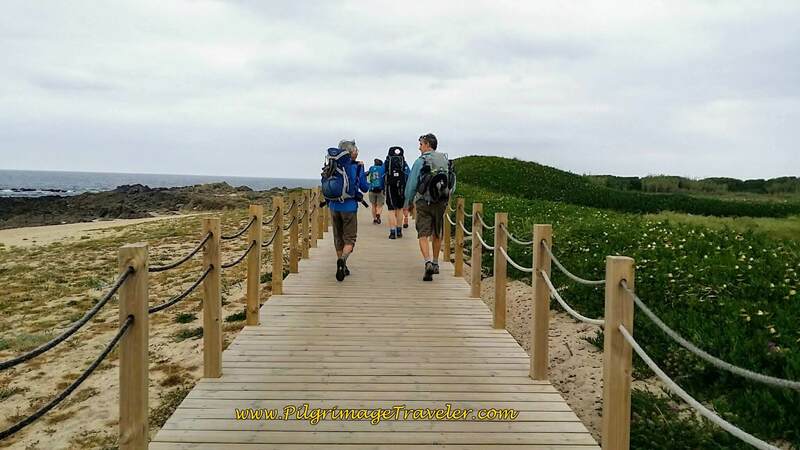 The Senda Litoral avoids the walk through a long string of suburbia, all the way to Povoa Varzim and adds several more kilometers to the day. 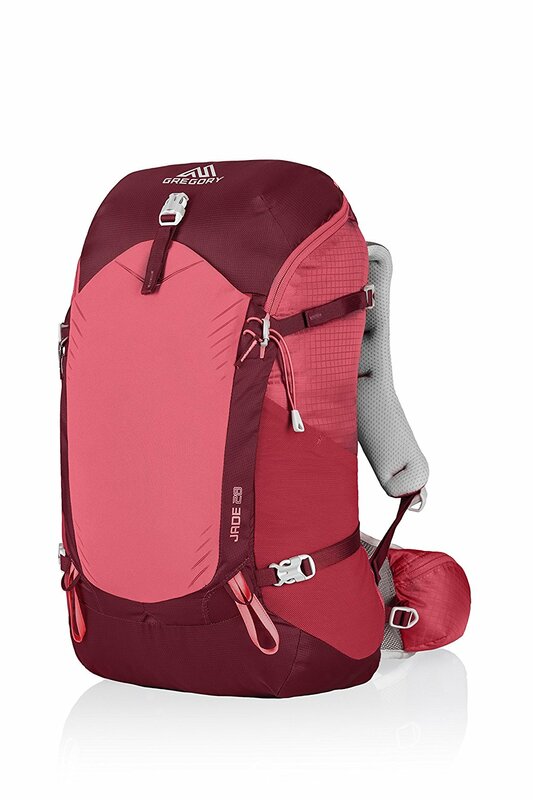 In retrospect, I wish I had chosen this option, because day sixteen on the Camino Portugués is a shorter day. 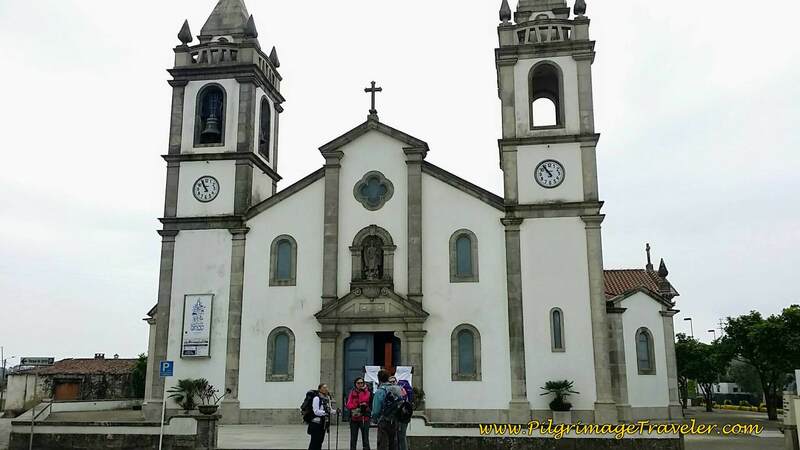 We, however, chose to continue on the Caminho da Costa. The Coastal Route turns right on Rua do Lidador, after the Praça da República and heads north into town. The street above crosses the Rua 25 de Abril, to walk past the wonderful little church of São João (St. John) that I visited at the end of day fifteen. If you are here when the church is open, you may want to stop in for a moment. It is worth it, and so is the view from the church terrace. 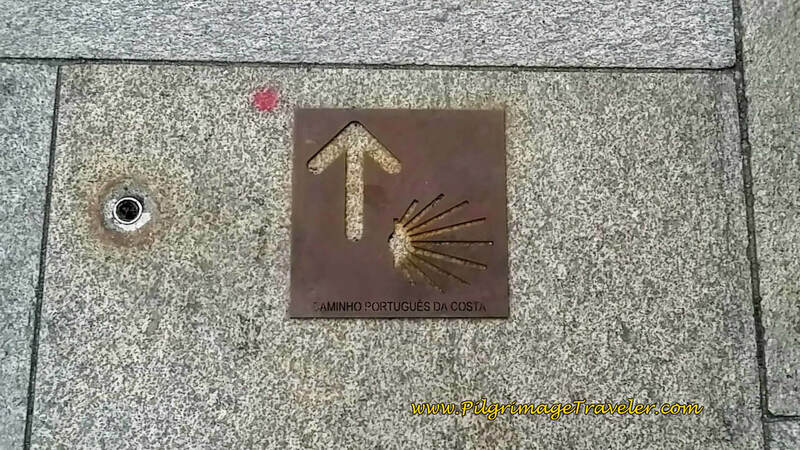 There are wonderful steel waymarks on the pavement in Vila do Conde, to reassure you that you are indeed on the Caminho Portugués da Costa. The pilgrimage traveler must then turn right on Rua da Costa, as it bends left, and heads northward. Here, you come to the Largo Antero de Quental, and turn left onto the narrow side street called the Travessa do Laranjal. 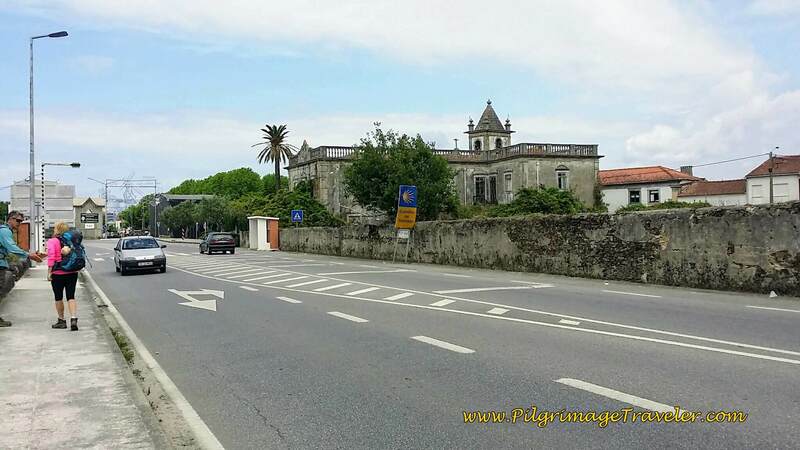 From there, you make a right turn onto the wide main street of R. Comendador António Fernandes da Costa, which shortly becomes the R. dos Benguiados. 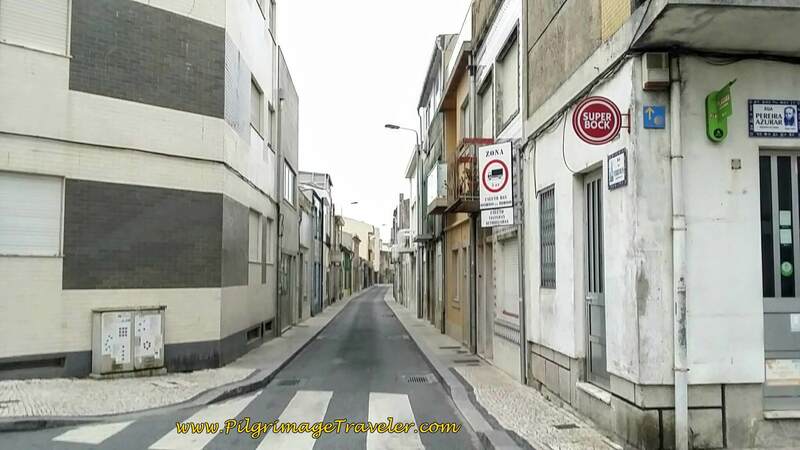 The Rua dos Benguiados comes to a circle, crosses the Avenida Júlio Saúl Dias with a large triangular-shaped fountain, and you are now in the town of Alto da Pega. Walk straight ahead and by amwalled school on your left. 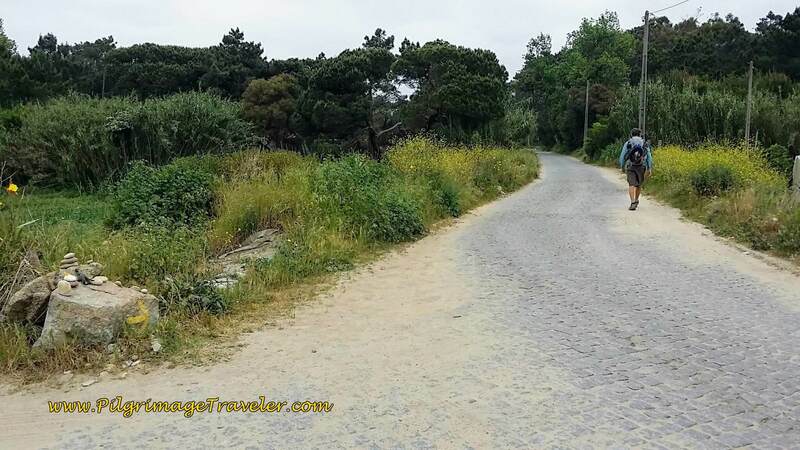 It is a four kilometer stretch between Vila do Conde and Póvoa Varzim, and I didn't take a lot of photos. It is just one long string of suburban sprawl. Not very photogenic. 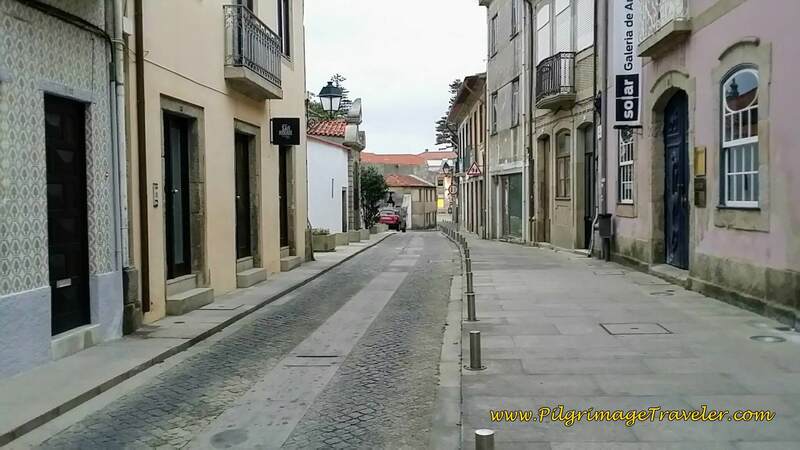 In 1/2 km the road becomes the Rua da Estrada Velha. 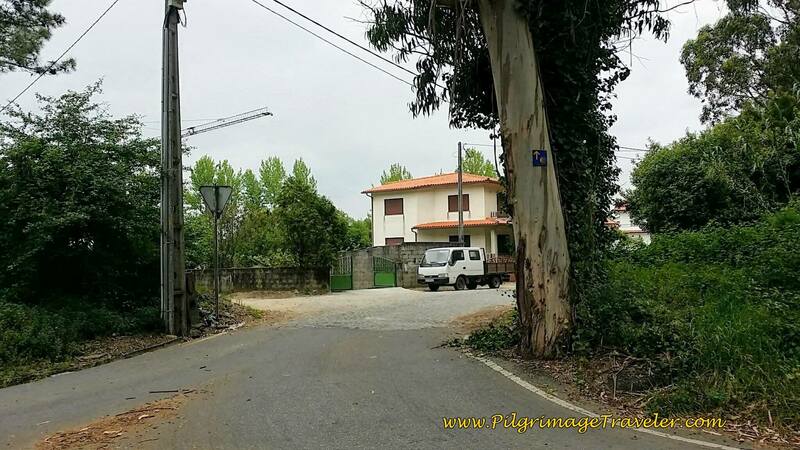 It now begins to look more rural, then the Rua da Estrada Velha bends to the left, continuing on a string of suburban roads, on way to the next town of Poça da Barca. This street crosses the Avenida Dr. António Bento, where road becomes the Rua das Violetas in Poça da Barca. 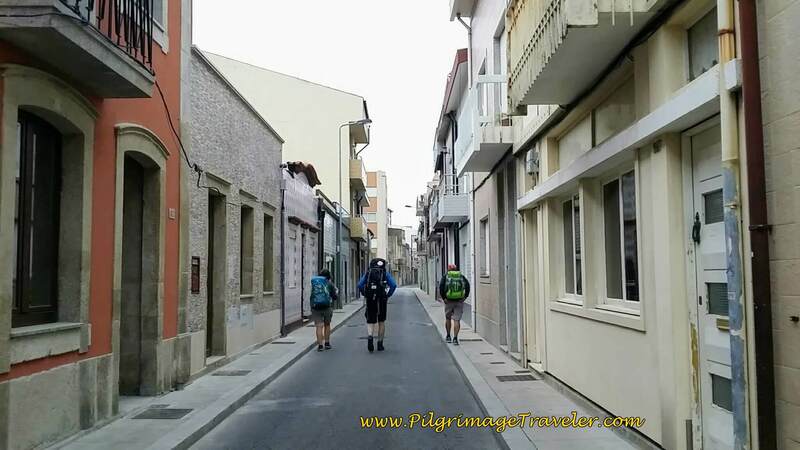 In another 1/2 km or so, the street becomes the Rua dos Ferreiros, and becomes more quaint, and old-town-like with high walls and narrow streets,as you walk into Povoa Varzim. After walking about another 600 meters or so turn left on Rua Dr Sousa Campos and head toward center of town. Enter the Praça da República and the Capela de São Roque immediately comes into view, guarding the entrance to the shopping district on the Rua da Junqueira, and its pleasant walking plaza. 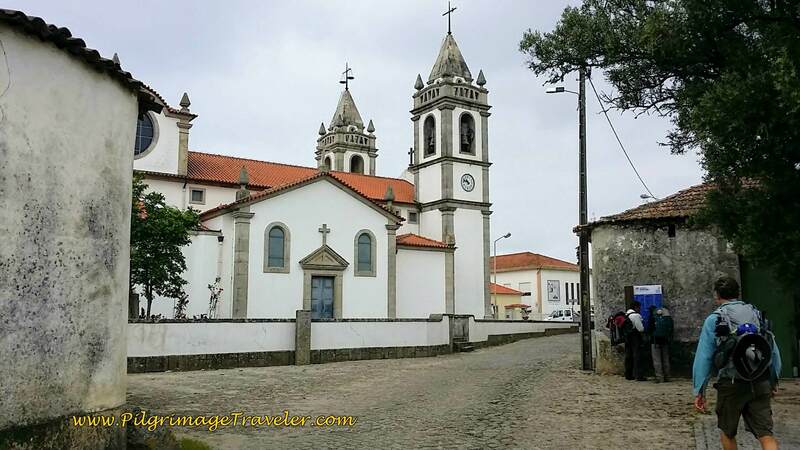 In the front of the church is the Monumento ao Carteiro (Monument to the Postman). There is a nice placard in front of the church, talking about the Way of St. James and the Coastal Route. 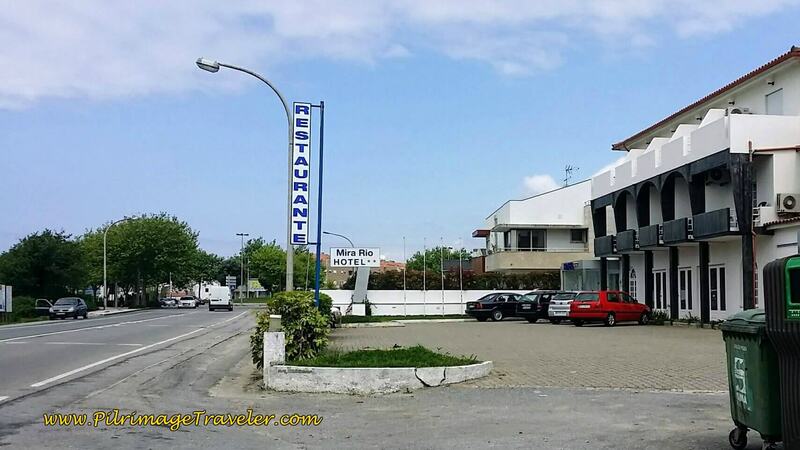 If you are staying in Povoa Varzim there are many accommodations and an albergue available. Click here if you desire reservations. 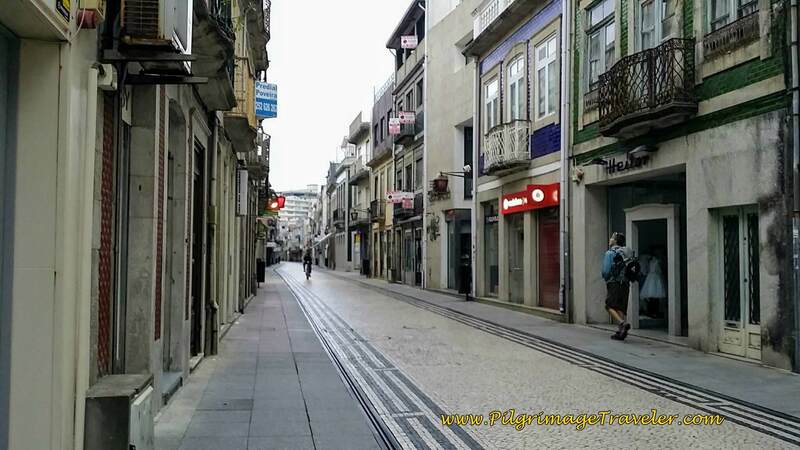 Walk along the Rua da Junqueira and through the shopping district. Turn right on the Rua da Alegria, and see the looming spire of the Igreja Paroquial de São José de Ribamar, below. 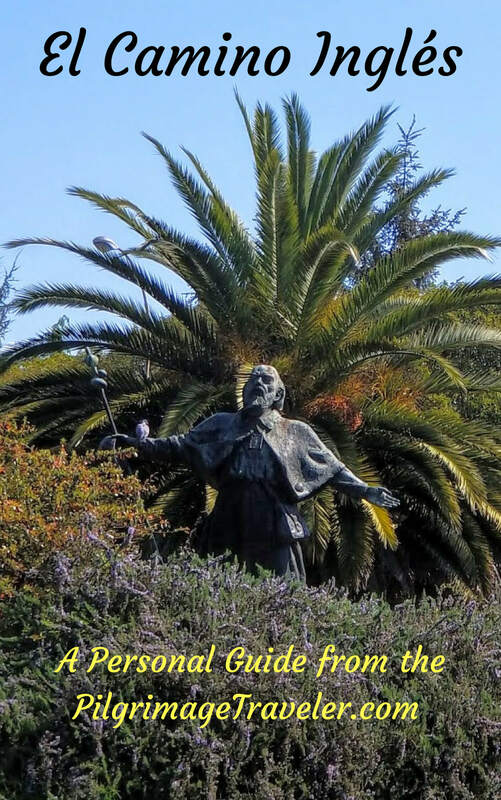 After the church, turn left on the Avenida Mouzinho de Albuquerque and head towards the sea, joining the Senda Litoral here. Turn right on the seaside street called the Avenida dos Banhos. 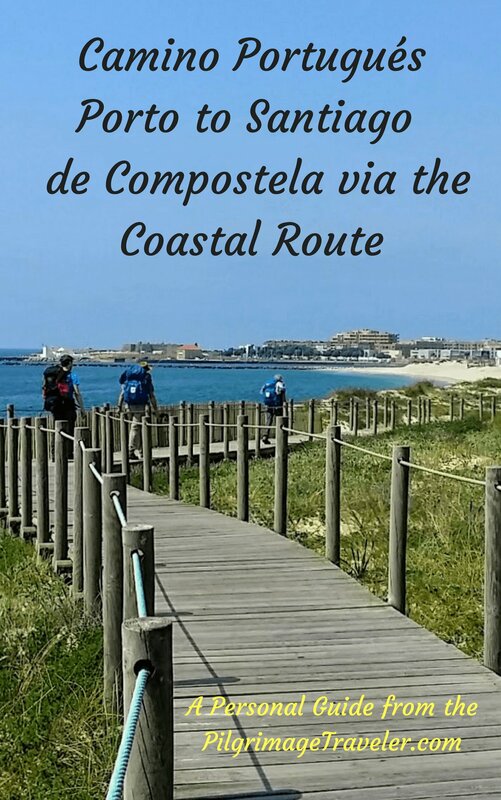 The Camino walks along this wide avenue, with it own promenade, along the beach called the Praia Redonda. 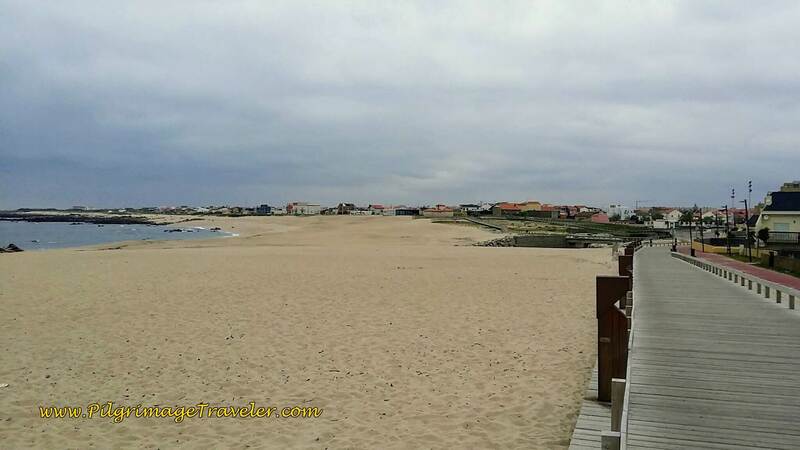 Continuing to walk north along the Avenida dos Banhos, is the next beach, the Praia da Salgueira. Below, you can see the walkway promenade. 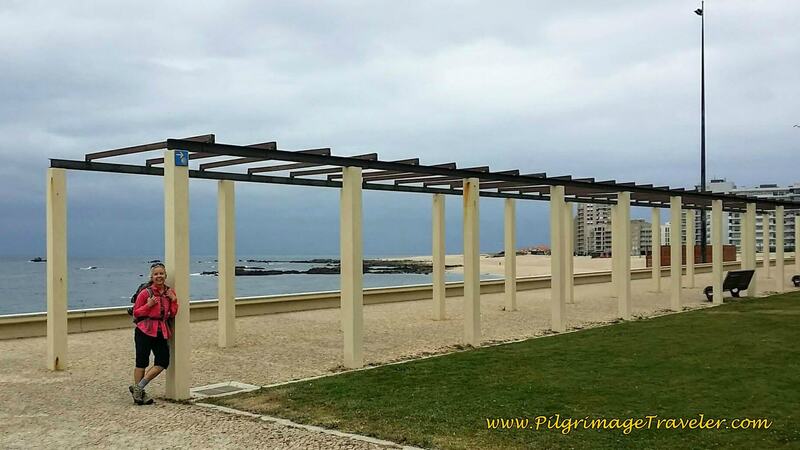 The Avenida dos Banhos ends after the giant sports stadium on your right and becomes a pedestrian way by this pergola, called the Rua do Alto de Martins Vaz at the Praia da Lada I. The cloudy day was becoming a bit blustery! 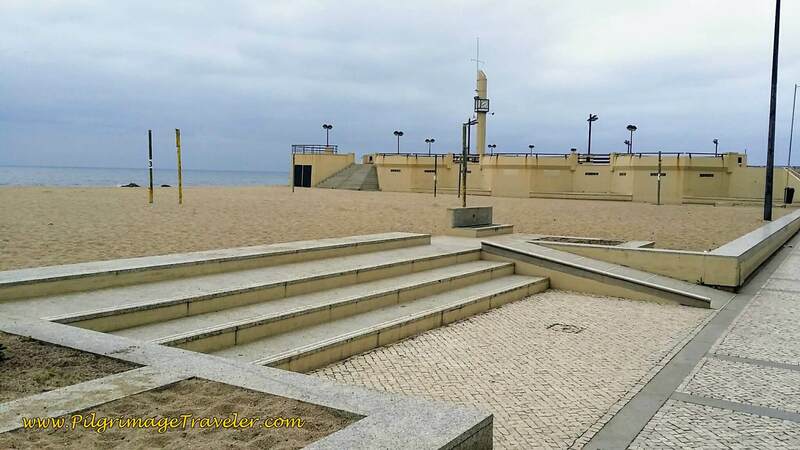 The pedestrian way walks on only briefly, becomes the Avenida dos Pescadores at the Praia Lagoa then becomes a pedestrian walkway once again. This section of the Way is all on cobblestone, or actually granite setts along the avenues and pedestrian ways. 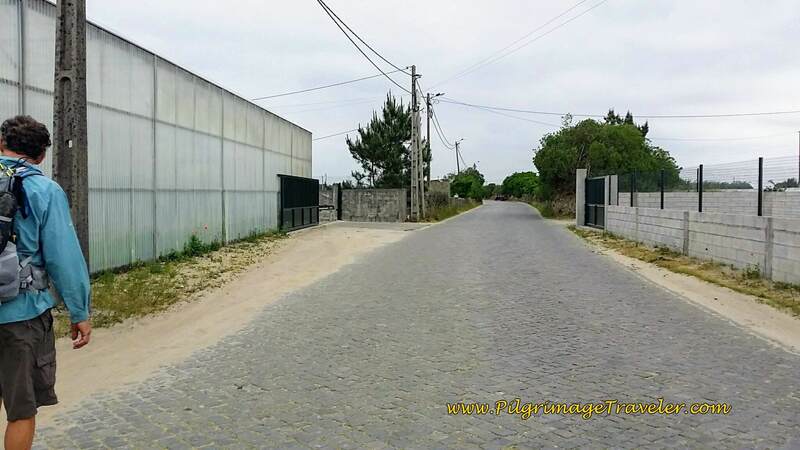 The Way continues on it's on granite cobblestone walkway as the Avenida dos Pescadores becomes a street for motor vehicles once again. At the side beach, the Praia da Fragosa we left the busy Avenida dos Pecadores as it bends hard to the right, and we stay to the left, closer to the shore, following walkways until the first boardwalk system begins. We are now leaving the developed beaches and skyscrapers behind. 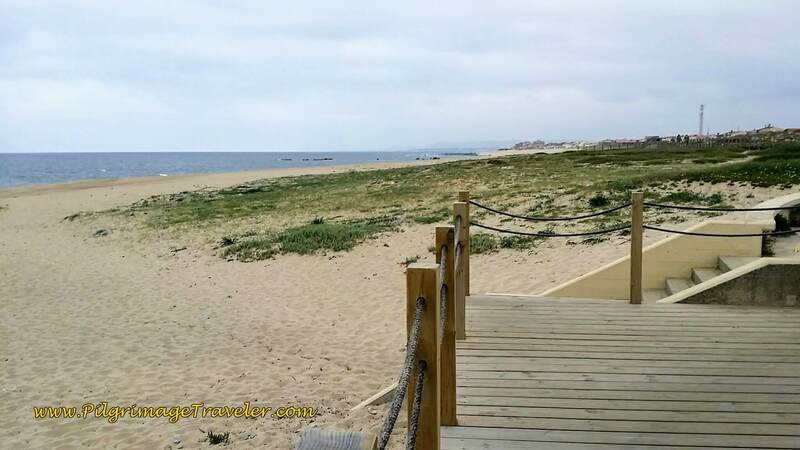 The boardwalk ends on the Avenida Jardim do Praia, by the beach the Praia do Esteiro. Continue on the Avenida Jardim do Praia for 750 meters or so, passing by one beach after another. 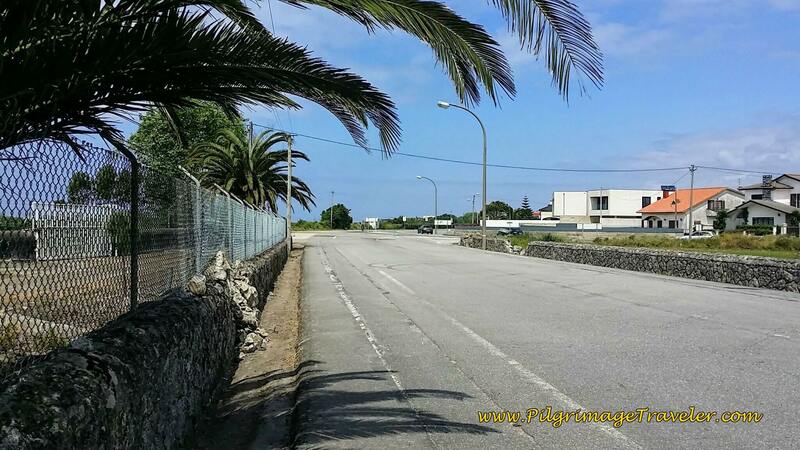 When the road ends, we turned onto the Rua do Sargaceiro, to walk again by the beach on a developed road. Here the beaches are rocky, and the beachfront is lined with quaint beach houses along the road. The Rua do Sargaceiro ends at a large roundabout, called the Largo de Quião with its Praia de Quião. It is here that the next boardwalk system begins. When you have the option to take a boardwalk, always take it, no matter what your guidebook says. We conferred with the locals here, and were told that it was OK to take this one! The beaches are rugged here and the wind was picking up. We put on our jackets and even got a brief spritzing of rain. We met more pilgrims, a Frenchman named Michele, seen below talking to Rich, on the boardwalk leading to the Praia do Santo André. 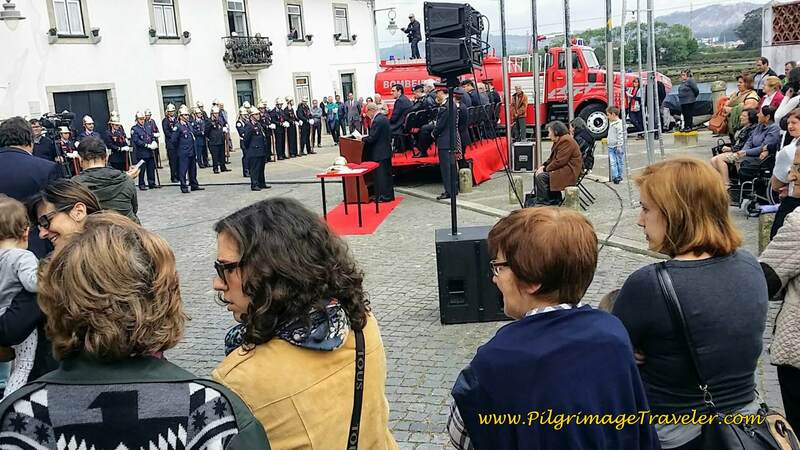 The pilgrims in front of them are the same ones we saw earlier in Povoa Varzim. While we chatted with Michele awhile, neither Rich nor I really connected with him He was nice enough, yet clearly an independant walker. No worries. It was his Camino. and our respect for him was high. 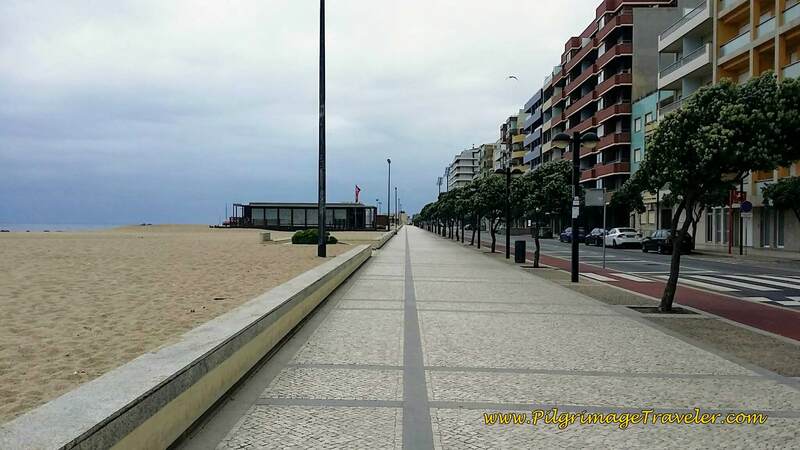 Once reaching the Praia Santo André, the boardwalk continues and walks past the Hotel Santo André, then joins the street, the Rua da Marginal for 150 meters before the 3rd boardwalk system begins on day sixteen of the Camino Portugués. In about 1/2 kilometer, when this boardwalk system ends, below, it turns to the right to meet the Rua da Marginal once again. 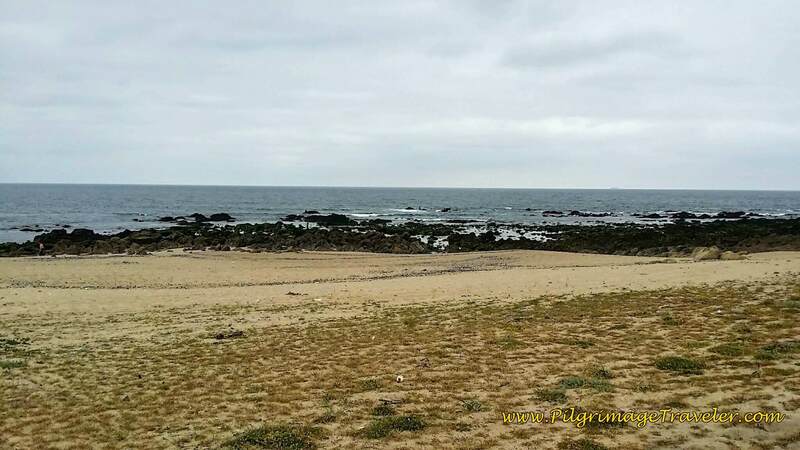 We walked for not quite 1 km on the Rua Marginal along the seacoast, on long straight concrete promenades toward the town of Aguçadoura and Aguçadoura Beach. Halfway towards Aguçadoura in the town of Areosa, we saw a sign pointing to a cafe, and we walked one block off the waterfront to see the Flor do Trigo pastry shop. 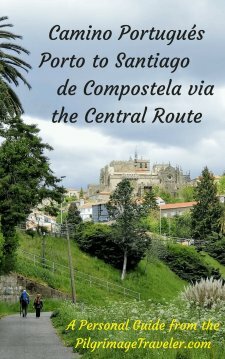 After the usual delights and coffee, and sandwiches to compliment the treats, we headed back on the Camino. We had logged in about 11 kilometers for the day, not quite halfway. 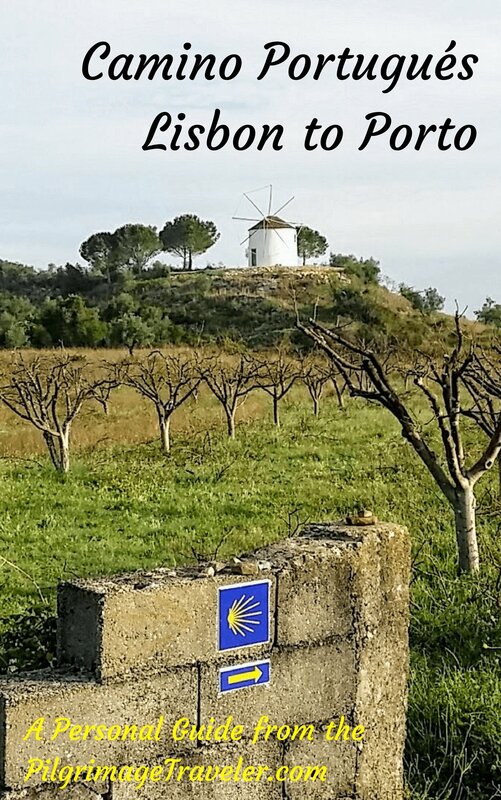 When the road ends at a carpark by the Aguçadoura Beach, the boardwalk begins again, winds around a bit, then walks straight on for about another 1.5 kilometers and past this windmill, pictured below. 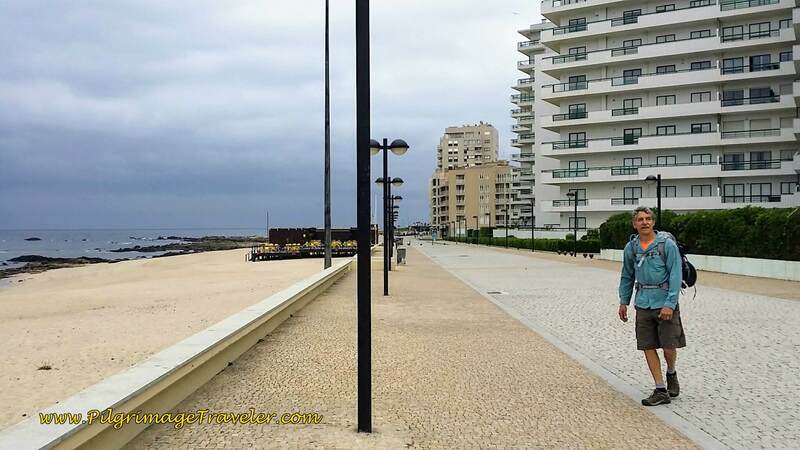 The boardwalk suddenly ends at a large sports complex, walks across the parking lot eastward, and inland to join the Rua da Codixeira, the M501. The Camino remains on the M501 for about a total of two kilometers. 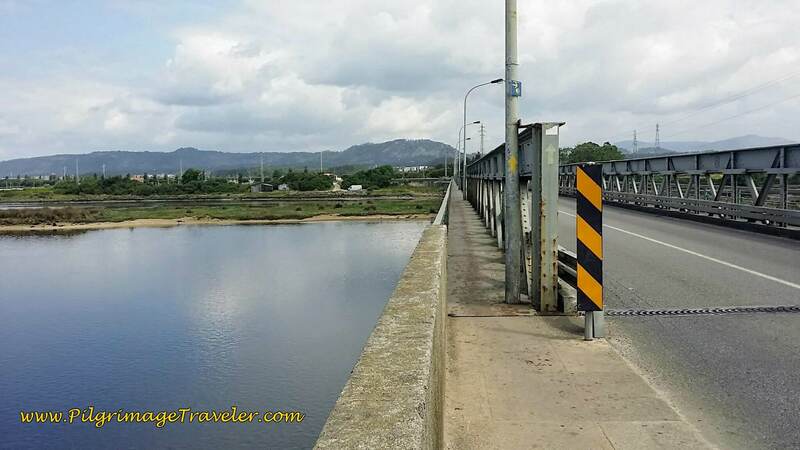 Take the inland route here, as there is no boardwalk after the sports complex, and you would have to walk a long, long way on sandy beaches to continue along the seacoast. 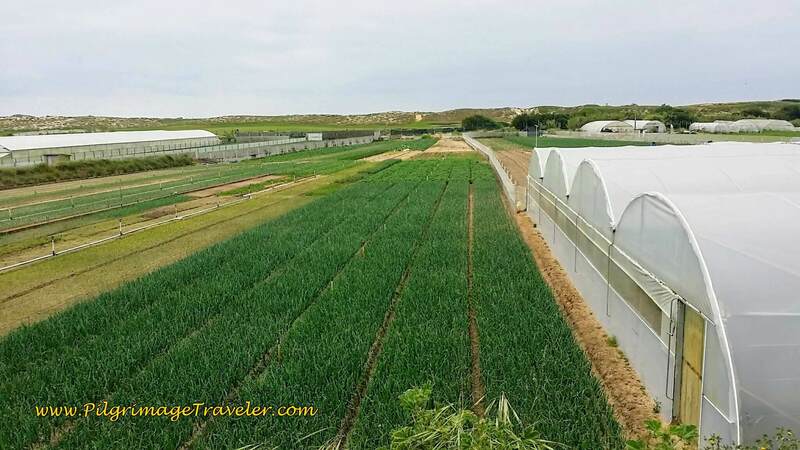 As we walked on the cobblestone roadway of the M501, we passed many a fertile field and greenhouses along the way. 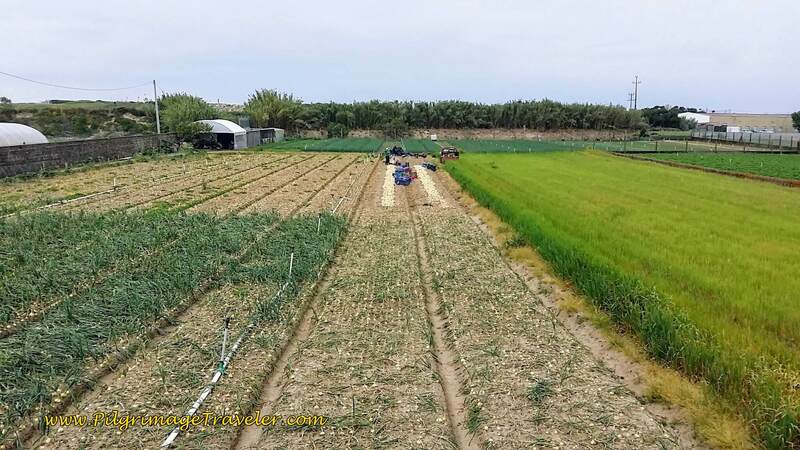 The crop below, we determined to be onions. I was not thrilled to be back on the cobblestone, but what can the pilgrimage traveler do? 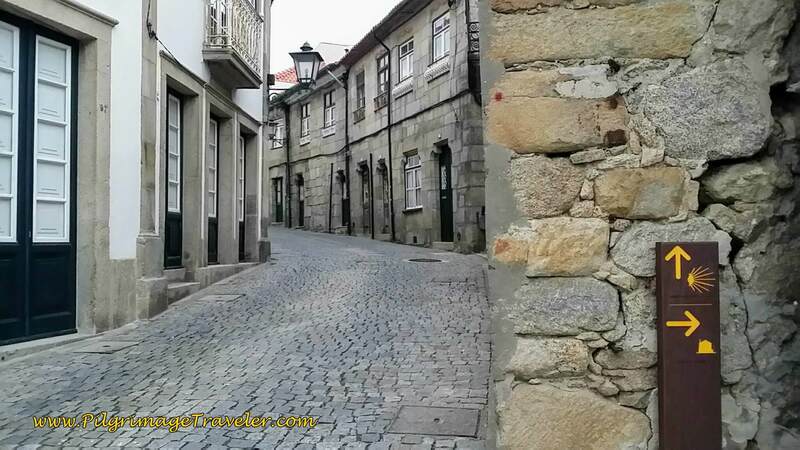 After the two kilometers on the M501, the Camino turns left on this side road, below, onto what else, but more cobblestone! After only 300 meters or so, we turned again, to the right at this intersection, onto another side road. You can see the yellow arrow on the rock, below. 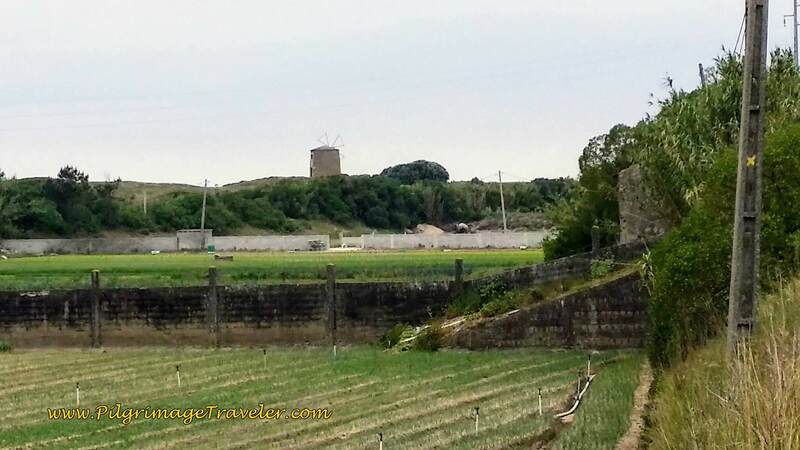 The windmill, in the distance, above, shown closer-up, below. We did not walk by this one. Along this quiet stretch we saw no one, not even other pilgrims. Eventually the cobblestone road turns into a farm road, then the Way turns left on another cobblestone side road through this greenway area. 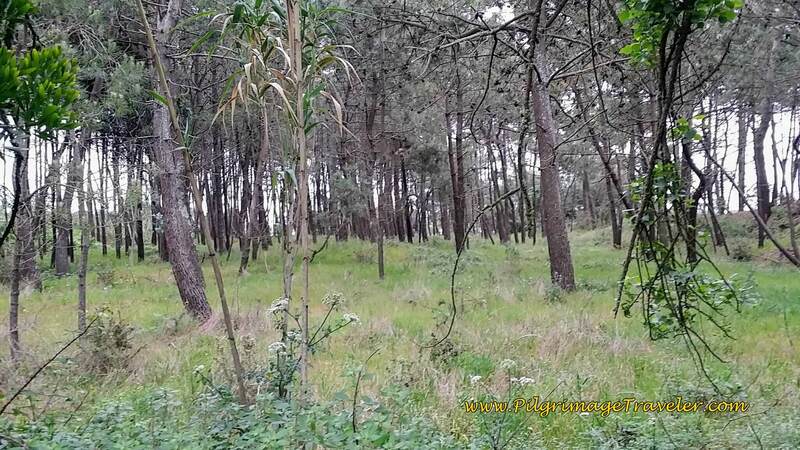 The Camino Portugués on day fifteen even walked through this forest. 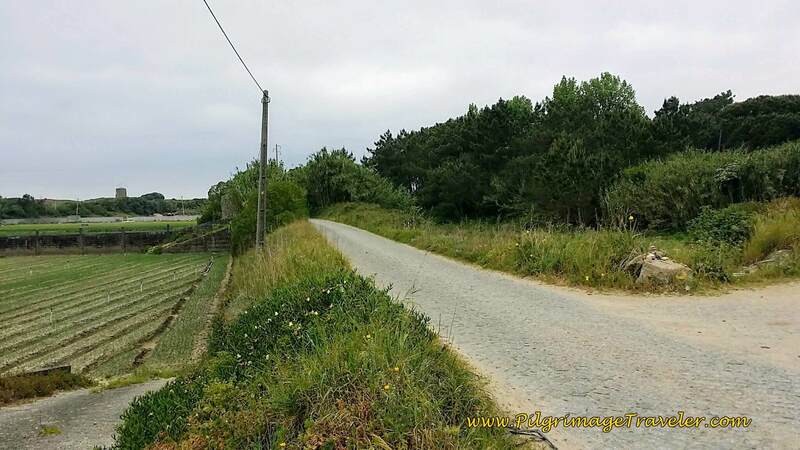 In about 2.3 kilometers after leaving the M501 and after the greenway, the Camino crosses over a larger road at a roundabout, and onto the Rua do Pinhal. You can see the Camino waymark on the large tree, below, where you walk straight on. You have the option here of turning left, instead of through the roundabout, to take the Senda Litoral to Fão, avoiding Apúlia. 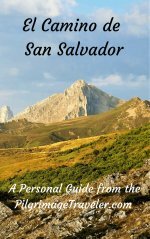 There are no waymarks to show you the way to the Senda Litoral here, so you will have to understand where you are to take it! I marked this spot on my Google map, above with a yellow hiker. 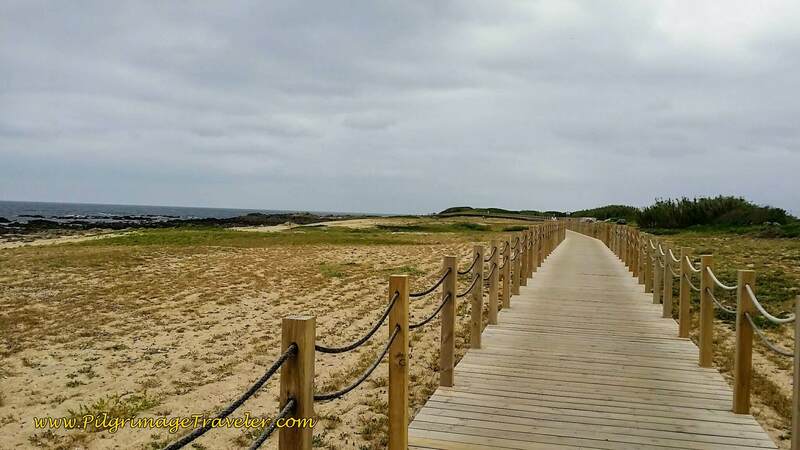 I am unaware if there is a boardwalk once you get to the seacoast at the Praia da Ramalha and I did not talk to any pilgrims who took this section on the Senda Litoral. 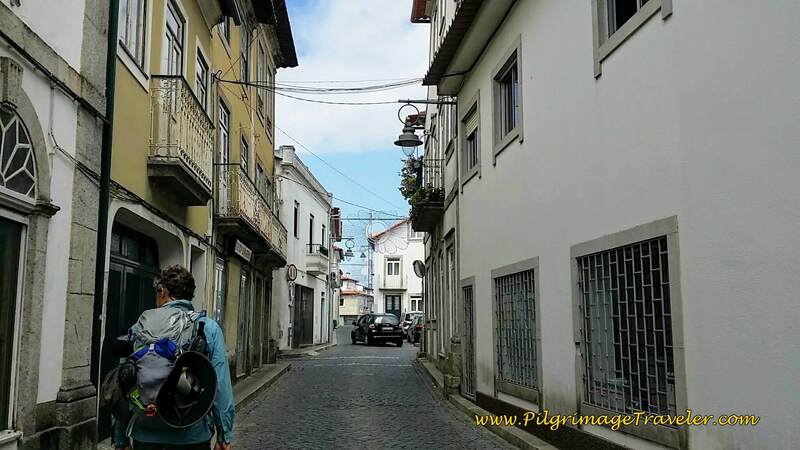 We chose to walk straight on the Caminho da Costa, walking on the Rua do Pinhal, as it was drizzling a bit and a touch windy. We did not wish to walk on the beach in the wind and rain. this was was also shorter and we had plenty of walking on the beach that day! 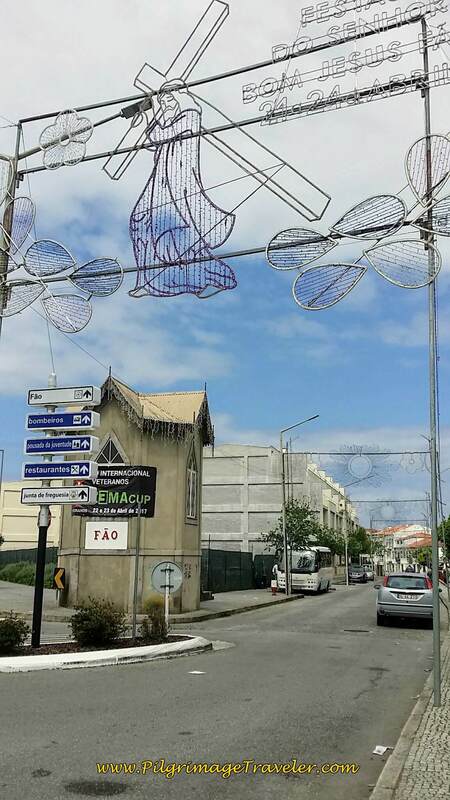 In 1/4 kilometer, turn left on the Rua da Igreja to walk into Apúlia. 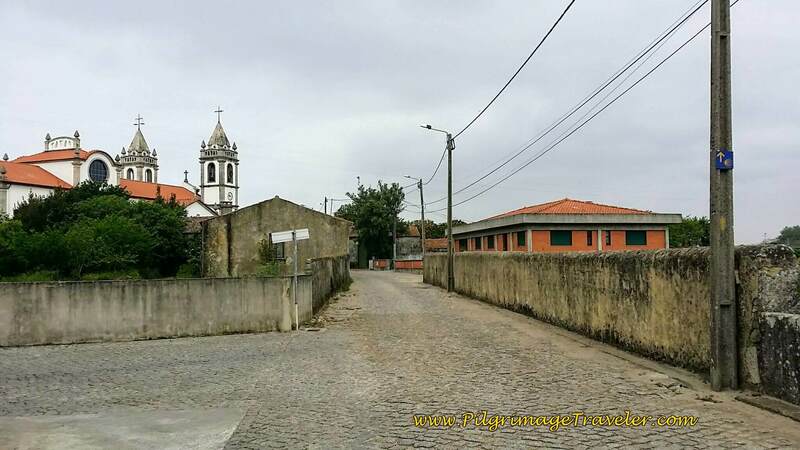 In the photo below, we are getting close to the Centro Paroquial Vila de Apúlia, or the Parish Center. There is a nice information board just before the church, below right, where two pilgrims are huddled over. They refused to look at us as we briefly looked over their shoulders, and then left. A language barrier is what I guessed. When we arrived at the front of the church, a group of ladies was coming out. Rich, once again, was in a chatty mood, talking to everyone he sees! Breathe Elle! Adjust! We would stumble upon these ladies a few times again, but we were keeping a faster pace. 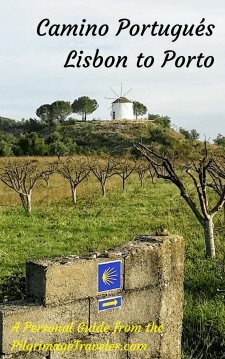 This would be the theme of the Portuguese Camino, from Porto. 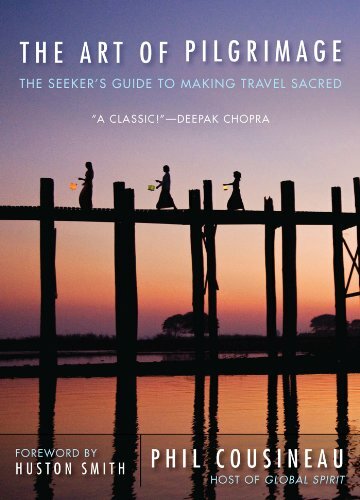 Many ways, many pilgrims, weaving their way in and out of our journey. 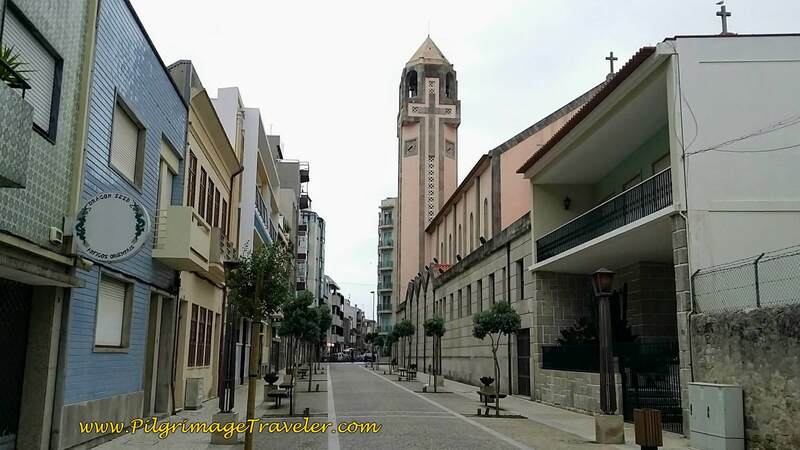 After the church, we continued on the Rua da Igreja, then shortly crossed over the Avenida da Praia (road to the beach, so you could turn left here as well for the Senda Litoral, if you needed more beach time). After this crossover, the road becomes the Rua da Agra. After about 1.5 kilometers on country roads, the Way becomes a lane through fields and forest. It was pleasant walking along this lane and I didn't mind not being on the coast. In about another 1/2 km the Camino joins the Rua da Ramalhão and walks by a large sports complex on the south side of Fão. 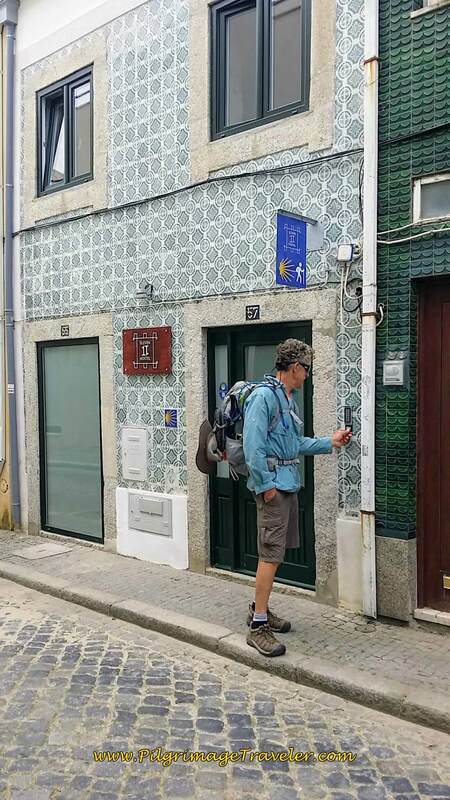 In yet another kilometer or so, turn right on the Rua de Santo António, then left in a couple hundred meters on the Rua das Almas. Several hundred meters more and you come to the busy N13 and turn left (north) to walk into Fão. Along this portion we met Janny from the Netherlands, and here Rich is chatting with her. Another new face. She was walking alone, was warm and very friendly. 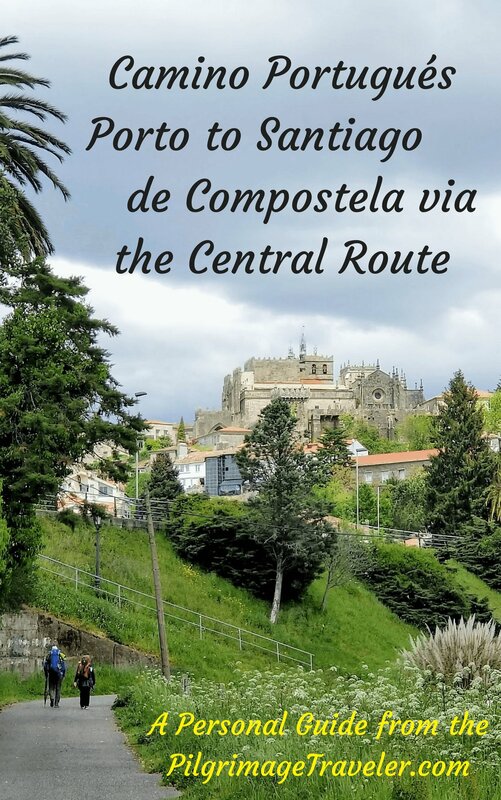 Ah, the never ending changes of face on the Camino Portugué from Porto! I needed to adjust. However, Janny would remain our companion for the rest of our Camino. A real jewel. We had to walk only briefly on the N13, before turning right at the first Y intersection onto the Av. Dr. Henrique Barros Lima, below left. In April of 2017 the Easter banners were still overhead. 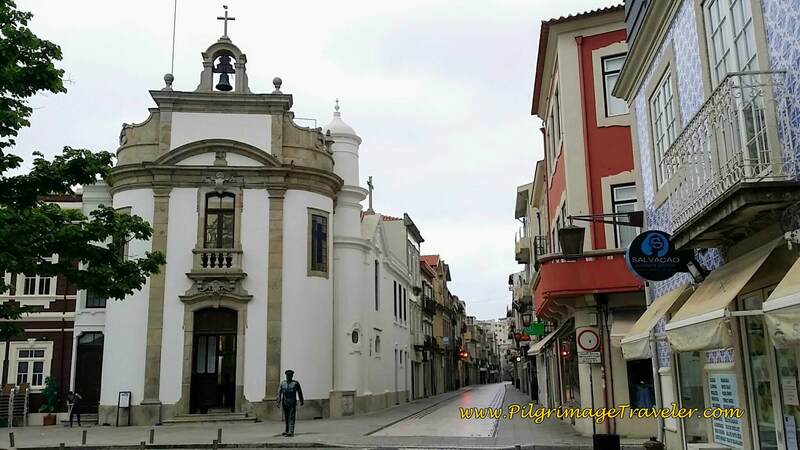 The street becomes the Rua Azevedo Coutinho, a quaint side street, and walks by this chapel, the Capela de Fão, below right. 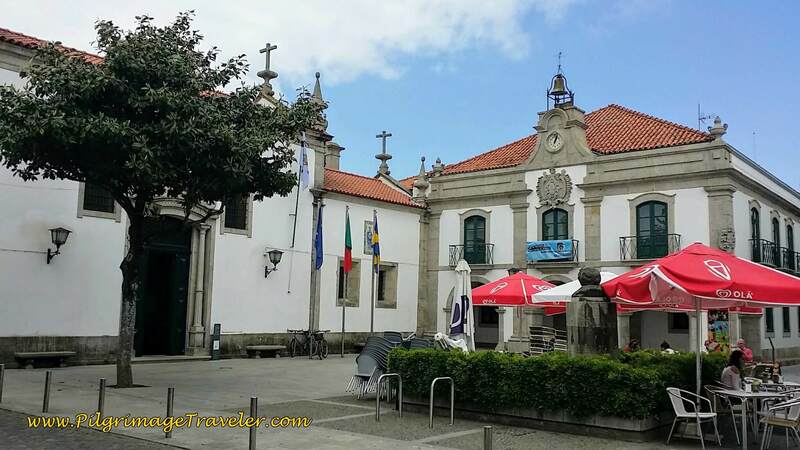 Close by the chapel, our eyes spied a pastry shop, the Pastelaria Clarinha, and so we followed our eyes! Our saying was fast becoming, "Never enough Nata!" and so we had one! With café con leite of course! If you don't know about the Pastel de Nata yet, it is a custard pastry to die for! Lovely custard-filled tarts, a delectable Portuguese treat! One of these butter, egg and milk-laden treats, with coffee and milk can take me at least 10 kilometers! When we had almost walked through Fão we came to the Bombeiros Voluntários de Fão fire station. As we walked by they were having an honors ceremony. Lovely to see. This had special meaning to Rich, since he is a volunteer fireman at our home! He just doesn't have quite so wonderful a uniform to wear! After the plaza by the fire department, we turned left on Rua do Cais, shown below, to meet the Rio Cávado. The bridge ahead is our destination toward Esposende. 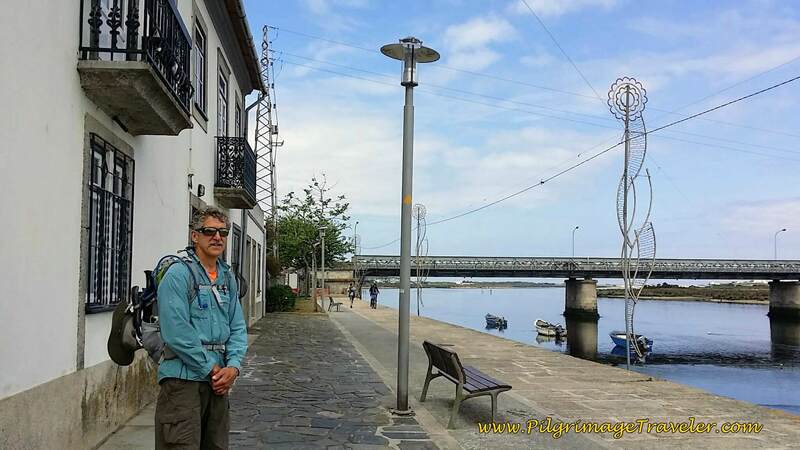 In less than 100 meters, on day sixteen of our Camino Portugués we joined N13, to turn and cross the river. After crossing the river, we immediately bent left onto the Rua da Ponte Dom Luis Filipe, a broad avenue, below, without a sidewalk, but an adequate wide shoulder. The first hotel, the Hotel Mira Rio appears in less than a kilometer after the bridge. 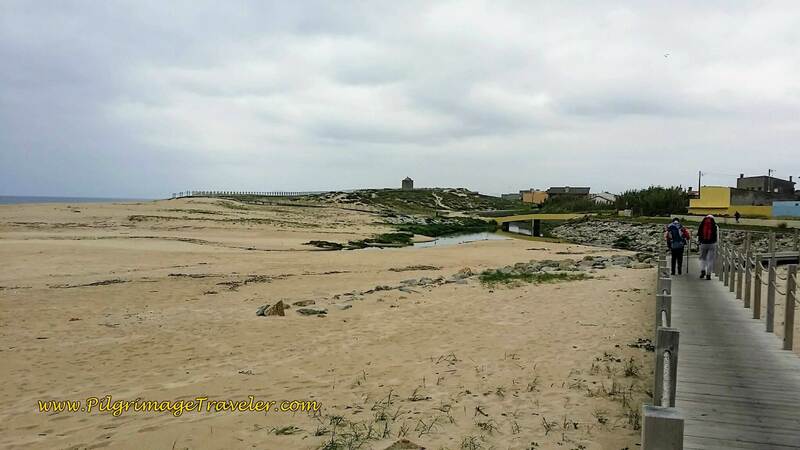 If Esposende is your destination, this is one choice and is right along the Camino, with a restaurant as well. For more choices, click here for pre-booking in Esposende. 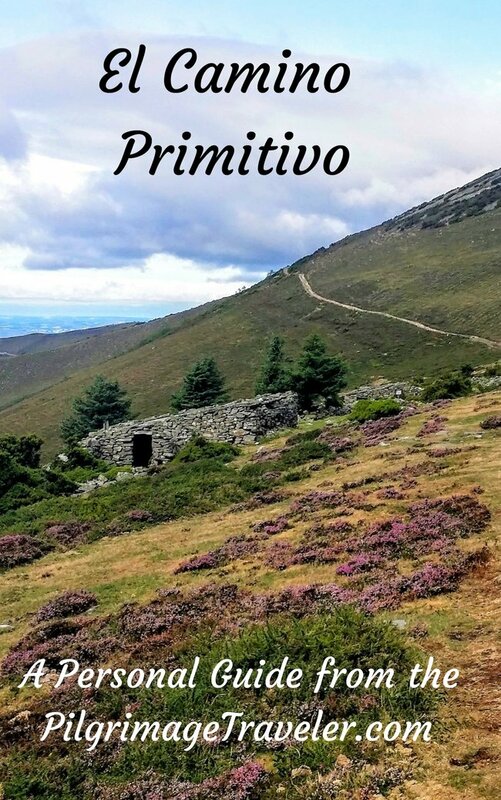 We wished to find the Privado in town, so we followed the Camino left at the next roundabout, immediately turned right, then an immediate left onto the Rua Narciso Ferreira that goes through town. In about 1/2 km we walked by the Hostel Eleven, where we ended up choosing to stay for the night. It is a long story how we happened to reserve at this delightful Privado. 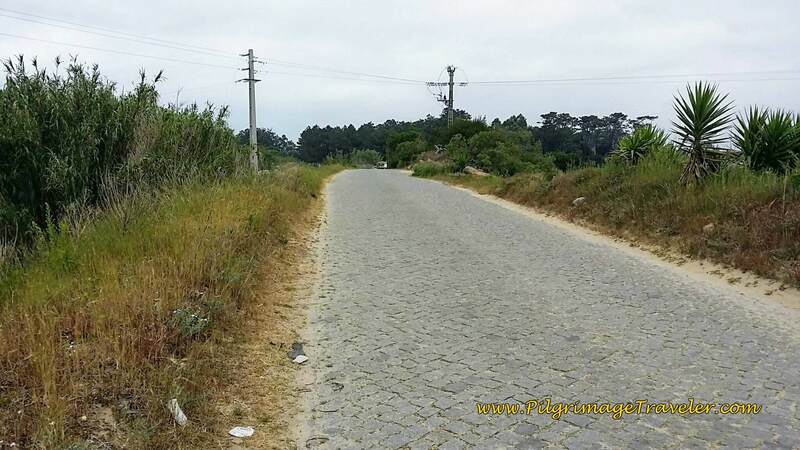 For some reason we had the idea that the municipal albergue four kilometers farther on in Marinhas was already full. It is a long way north to the next accommodation, and we did not want to have to back track to Esposende. After locating the Hostel Eleven, we went on into the town square to look at making reservations. We sat at the Pastelaria Doce Rio for a beer, below, and asked the waiter there about the muni ahead. He said that indeed he heard that it was full, and it would be best to try to get reservations here in Esposende ASAP. I tried to book the Hostel Eleven on my smart phone, to no avail! We asked the waiter again for assistance, and he called someone, and said that everything was full! What? I didn't think we saw that many pilgrims! It was only the end of April! Something just didn't make sense. We figured that we might have to pay a bit to spend the night at the beachside somewhere, but we would be fine. We decided to wait for the Hostel Eleven to open at 4:00 and see what was up. 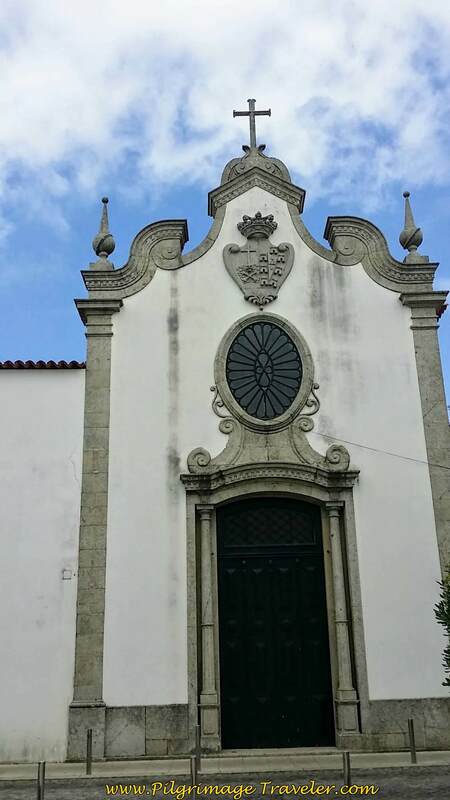 Meanwhile, we spent the time visiting the church, the Igreja da Misericórdia, below left, and city hall, the Câmara Municipal de Esposende, below right. You can also see the café in the foreground where we had beers. The small church was simple and delightful. I said a prayer for our friend Rob, walking and carrying his illness. When we rang the doorbell at the Hostel Eleven after 4:00, it turned out that there was plenty of room. In fact, there was only one other Canadian couple who stayed there that night, with whom we barely spoke. It must have been a Booking.com glitch, and we were glad we tried the Hostel Eleven in person. In turned out to be a gorgeous, brand-new place, with very friendly folks running it. A large continental breakfast was included in the somewhat steep price of 40 Euro for their double room. It's about 12 Euros/person with breakfast in the dormitory. To see more photos of this lovely place, click here. I highly recommend it. For dinner, we went to the restaurant a few meters down the street from the hostel, the Restaurante Adega Regional Do Cuco. I am sad to say, that I cannot recommend it. They served us bad wine, and a so-so stew that was the "Pilgrim's Menu." I think it was discards from the day prior, myself. The Hostel Eleven does have a kitchen, which you could use to cook, as an alternative option! The ever changing pilgrim faces were a new force with which I had to reckon. 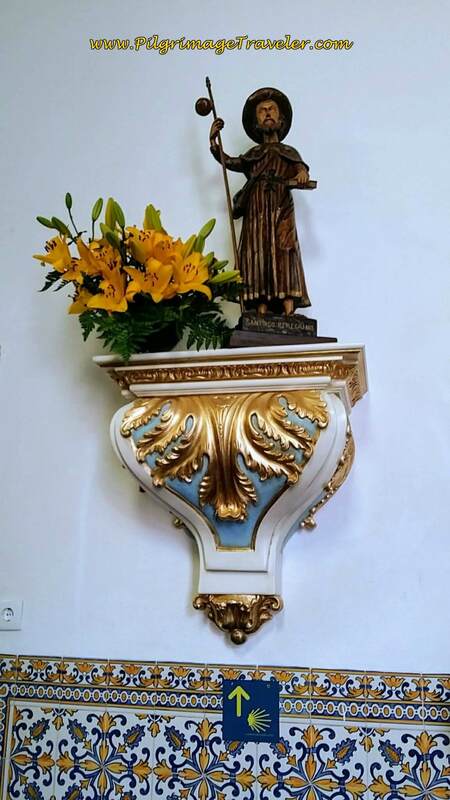 While I love the quote at the beginning of the article from the Pilgrim's Office Chapel in SdC, to collect names (and dawns) what was happening on my Camino suited me too good! As in the prior day, I knew that I would adjust. As the famous Buddhist saying goes, "And this also I shall include." Include into my soul, all that is presented to me, whatever it is and however I judge it to be! 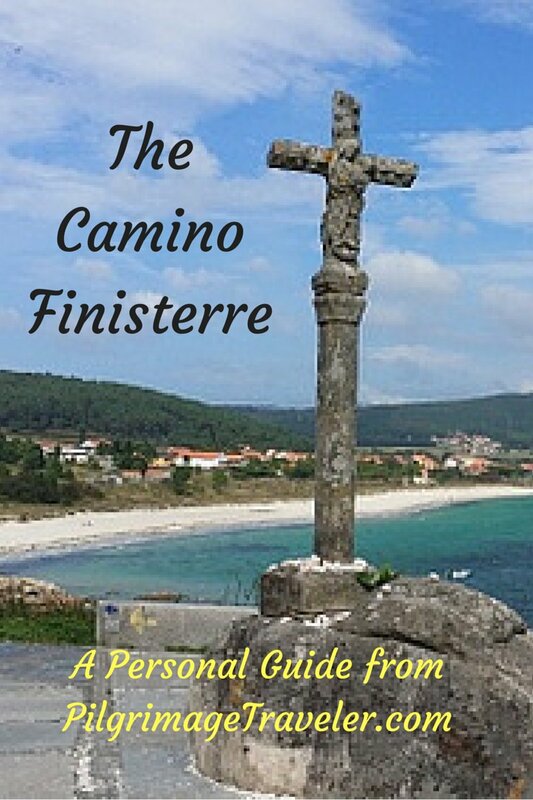 It is all part of the Camino experience. Anyhow, there is nothing that will make you feel better on the the Camino than pastel de nata and a café con leite. Seriously! 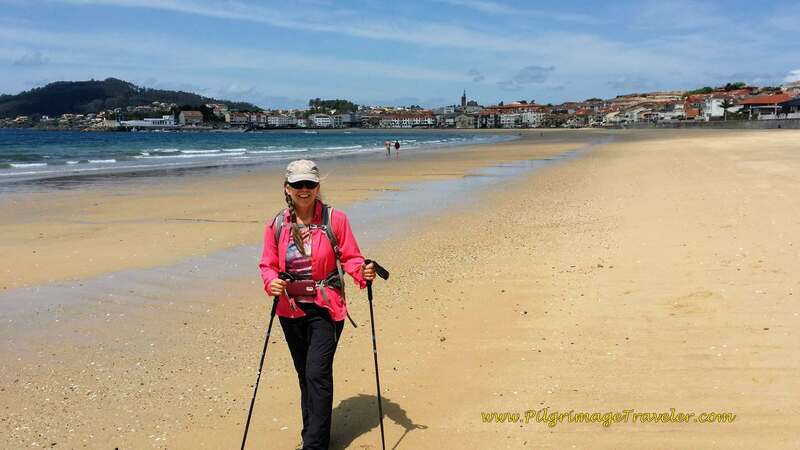 We indulged three times on day sixteen of our Camino Portugués! A small piece of heaven with every bite! May your own day sixteen on the Camino Portugués be filled with names, connections and a gorgeous dawn. Or may you adjust to whatever comes your way! Ultreia!